Jungles Mid or Jungles Middle is a lush, jungle-covered island featuring hidden ruins in the middle of the map in the DLC: The Center. 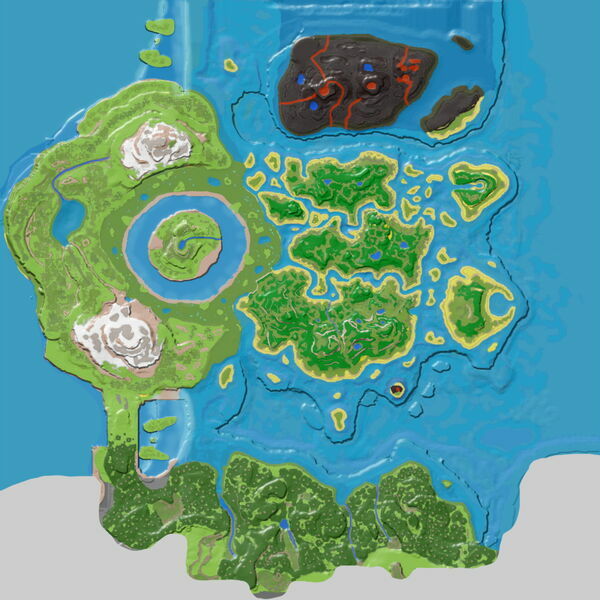 Notice: Until The Center has official region names, this page represents the Jungles Mid spawn area, the entire Middle Jungle island, and the adjacent rivers/shorelines. There is a cave if you go to the ruins. Around Lat. 28, Long. 55 is a pond with beavers (Castoroides) and Coelacanths for food, 2 dams on average consisting of 600(ish) wood per dam. This area has a total of five entrances (one of which is a cliff) and is very defensible. The cliffs above the pond contain both crystal and metal. Ramps can be built to access these resources. Be warned, there is an entrance which is patrolled by various carnivores including Allosaurus, Raptors (including Alpha variations), and Sabertooths. Lat. 38, Long. 69 is a cave opposite the beach. There might be Megalosaurus who are usually mate boosted. This page was last edited on 5 March 2019, at 07:17.